The most useful apps are not always those that are the most flashy, featured-filled, or technologically advanced. Rather, what really makes an app useful is when it contains the information you need in an easily accessible format. That is certainly the case with theChestReg, which is designed for all healthcare professionals but particularly focusing on those practicing pulmonary medicine. 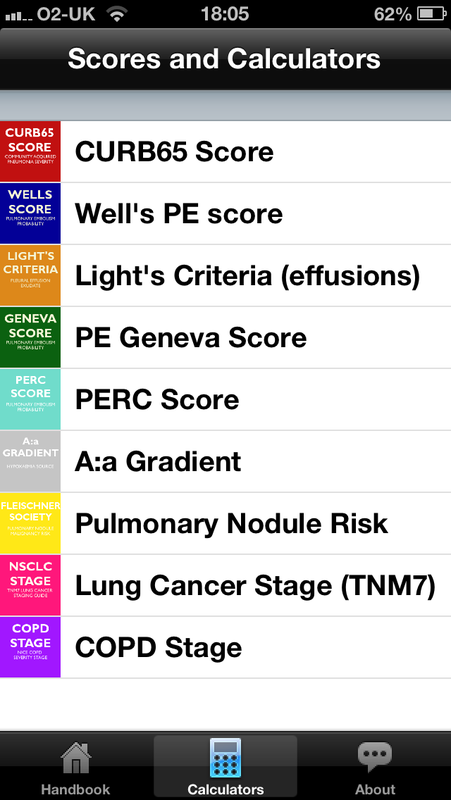 theChestReg app contains clear concise notes on topics of interest in pulmonary medicine alongside the major respiratory calculators/formula. This information is provided mainly as an memory aide to be used at the point of care. While it is aimed at those specializing in pulmonary medicine, many junior physicians and medical students will find it particularly useful. 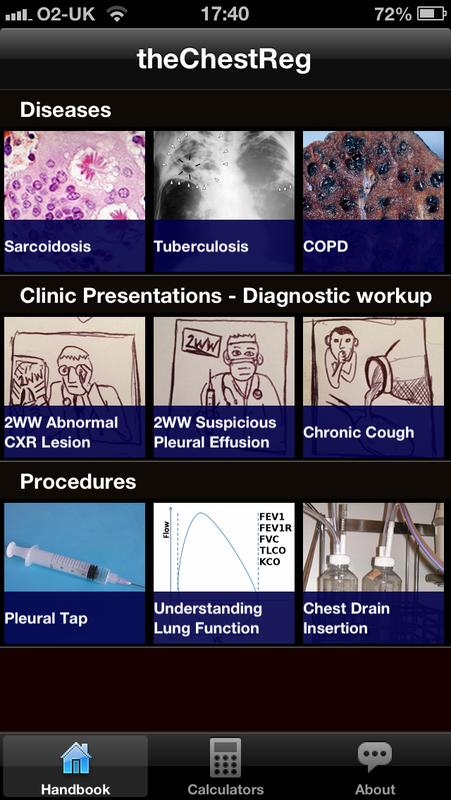 The Diseases tab contains information on common respiratory conditions such as asthma, COPD and lung cancer. Each of these topics has an overview that includes useful and relevant information (see the screenshot for more details). 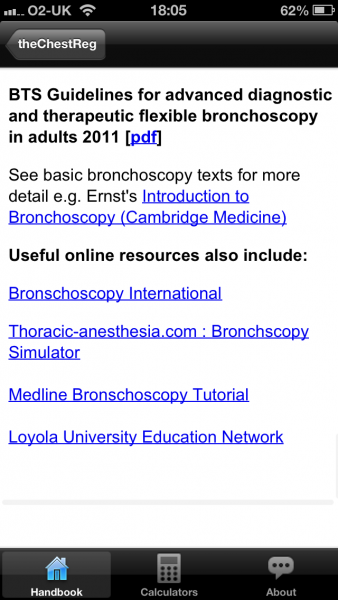 All of the information provided throughout the app is referenced and hyperlinked; tapping on a reference brings you directly to the referenced paper itself. 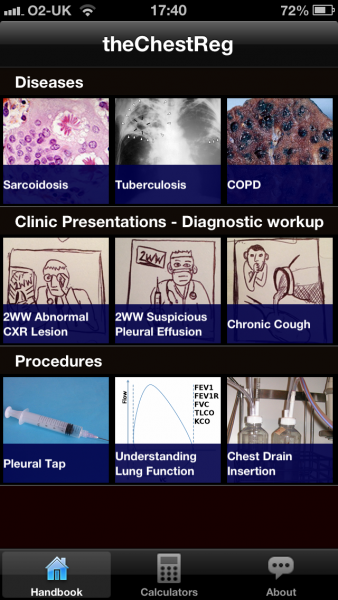 The Clinical Presentations tab contains information related to common presentations of various diseases and is laid out in much the same fashion as the Diseases tab. Each clinical presentation contains a list of differential diagnoses and includes the salient features of each of these such as a time scale (e.g. 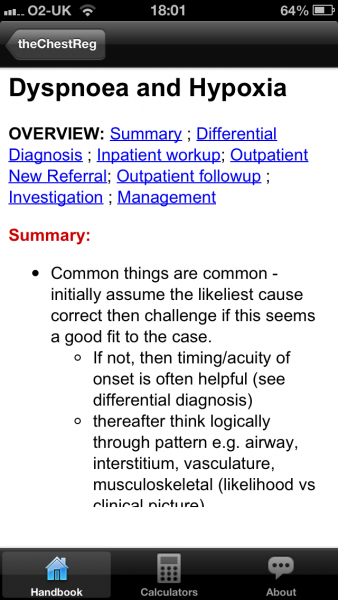 Acute, chronic etc). The Procedures tab contains a complete overview of the common respiratory procedures such as chest drain insertion and bronchoscopy. 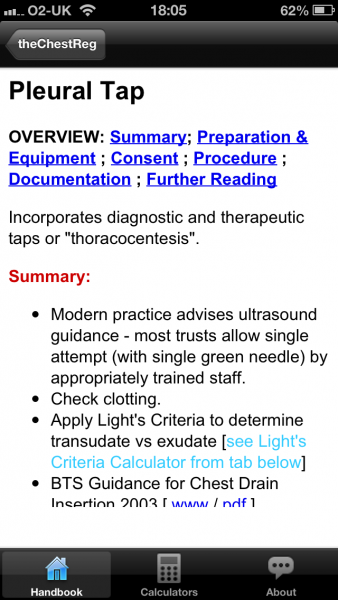 For each procedure there is a pre-procedure checklist as well as specific consent issues and additional documentation. 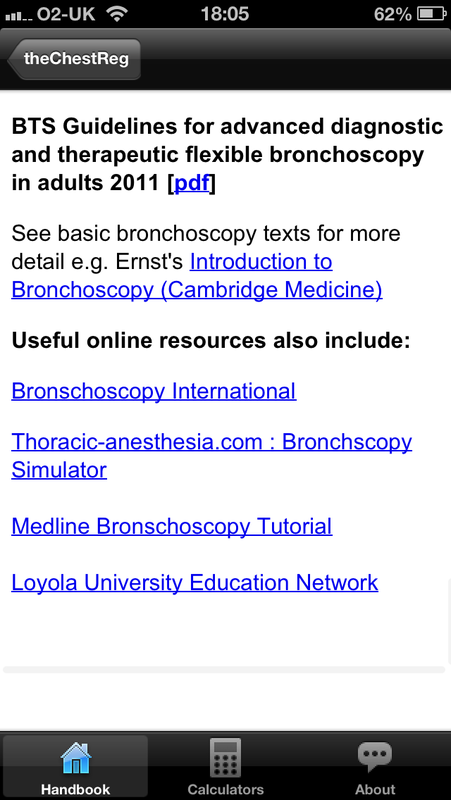 For many procedures, there is an additional reading section that seems to be aimed at more senior physicians. The Calculators tab contains 9 calculators which are commonly used in a pulmonary medicine setting such as CURB65 or Well’s PE score. These calculators update on the go and offer basic management advice. 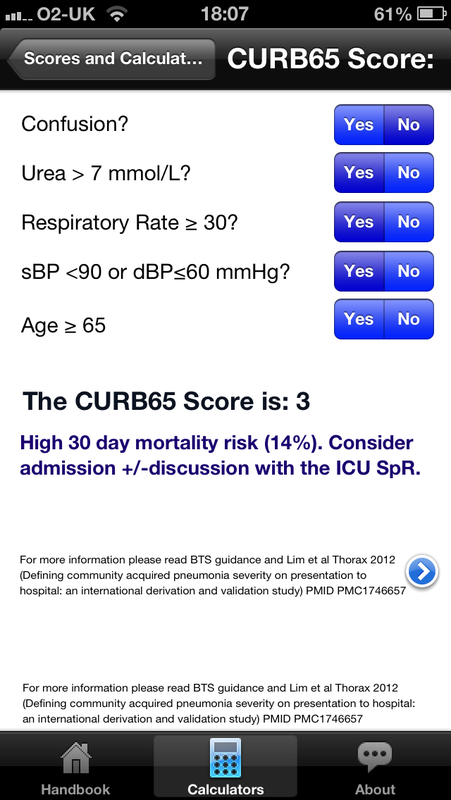 This is a fantastic app to have available to keep up to date with respiratory medicine. The quality of the content is very high and well referenced, covering a lot of essential information in a concise format. 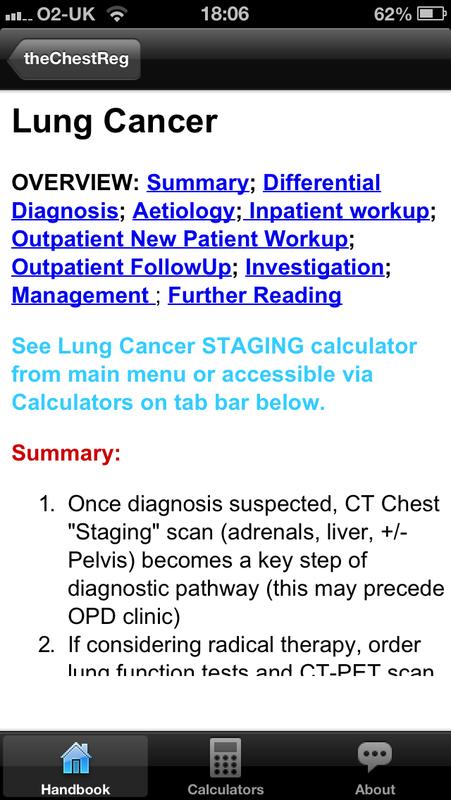 The addition of calculators and procedures make this app my go to place for respiratory medicine. Disclaimer: This post does not establish, nor is it intended to establish, a patient physician relationship with anyone. It does not substitute for professional advice, and does not substitute for an in-person evaluation with your health care provider. It does not provide the definitive statement on the subject addressed. Before using these apps please consult with your own physician or health care provider as to the apps validity and accuracy as this post is not intended to affirm the validity or accuracy of the apps in question. The app(s) mentioned in this post should not be used without discussing the app first with your health care provider.